Empowering African American Males with Disabilities to Overcome Barriers, Become Self-Determined, and to Graduate High School College & Career Ready. 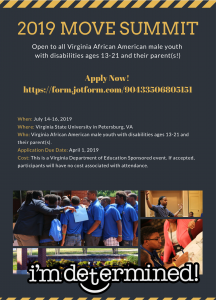 Each July, the Virginia Department of Education welcomes African- American males with disabilities from across the Commonwealth to participate in a three-day summit. The MOVE Summit is sponsored by the Virginia Department of Education. All costs associated with lodging and meals are covered, as well as reimbursement for mileage to and from the event. Applications will be reviewed and acceptance letters will be emailed on or before May 20, 2019. Days Until 2019 MOVE Summit!